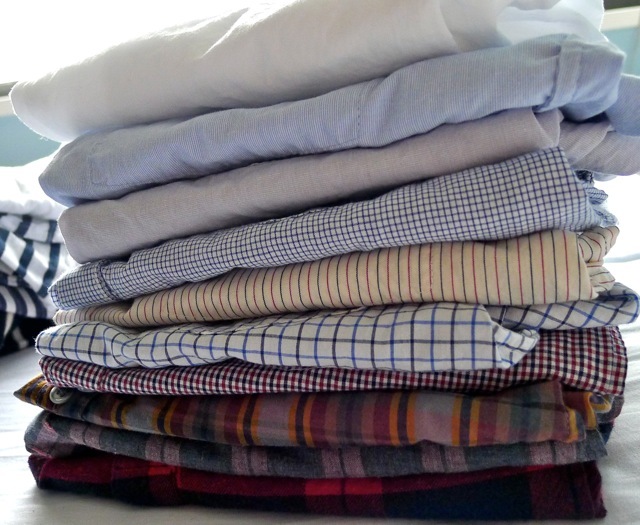 "He took out a pile of shirts and began throwing them, one by one before us, shirts of sheer linen and thick silk and fine flannel which lost their folds as they fell and covered the table in many-colored disarray. While we admired he brought more and the soft rich heap mounted higher--shirts with stripes and scrolls and plaids in coral and apple-green and lavender and faint orange with monograms of Indian blue. Suddenly with a strained sound, Daisy bent her head into the shirts and began to cry stormily. "'They're such beautiful shirts,' she sobbed, her voice muffled in the thick folds. 'It makes me sad because I've never seen such--such beautiful shirts before.'" that famous scene from F. Scott Fitzgerald's novel is laden with meaning and a tragic sense of loss, but there's something comical about the whole thing too. it's also one of the great literary passages describing what sounds like a magnificent wardrobe. a great button-down is so important, and my everyday favorites are my steven alan reverse seam shirts. 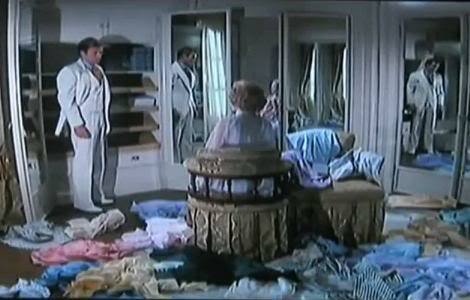 minus the heavy undertones of unrequited love, all that shirt-throwing looks kinda fun. but back to the shirts. i first discovered steven alan's reverse seam shirts a few years ago, around the same time that i started writing this blog. since then, i've collected a small stash, and they've become a constant staple in my closet. steven alan shirts are cut with just enough room for that perfectly tomboyish, garconne fit. i think there's nothing worse than a too-tight button-down shirt on a woman. i love the signature quirky details like the reverse french seams, the twisted placket, and inside pocket...all of which allows the wearer to enjoy the spirit of the button-down without feeling constrained by it. the cotton woven shirting materials are also low-maintenance (read: machine wash and tumble dry, no shrinkage), which means you could (and probably should) totally throw a shirting party à la Gatsby and Daisy and then pick one up the next day and wear it out the door. the natural, slightly rumpled texture of the cotton reminds you not to take life too seriously, that there are better things to do than ironing shirts. it's also nice that they're all still made in the US, and made well. many of mine are 3-4 years old at this point, and they all look great. i'm about to pack for a work trip, and given that it will be in the 60s and 70s where i'm going, i'll be packing a week's worth of SA reverse seam shirts as the base of my wardrobe. might do another post on that this weekend. do you have any button-down shirts by SA or others? how do you like to wear yours? edit: many of you have asked about sizing on the steven alan shirts. see my responses below in the comments, and in my FAQ. Well I know where to go if I need another shirt, which I don't (which is both a happy and sad thought). I wish Steven Alan was more easily available where I am, but it's probably just as well it isn't, for the sake of my wallet. Love this tribute to your shirts! I've been curious, what does "reverse seam" mean? Can't wait to see your next post, and have a good trip! i don't think i 'need' a lot of the items i really love. a perfect button-down is like a breton shirt for me; i don't mind multiples! I've never seen Steven Alan shirts in person, but they look really nice. I wear shirts all the time, but most of mine aren't button down, they're just buttoned half way. I usually wear them with jeans, half tucked if I can get it right:)! I've heard so many great things about these shirts, especially with how well they hold up. I think I'll get one soon to try it out. But can you tell me how the sizing runs on these shirts? Most of my clothes are xs, but lately I've preferred a looser fit and have bought new things in s. In APC shirts, I'd wear an S. thanks in advance! the steven alan website has a fit chart for their different shirting styles. i wear usually an S in the SA reverse seam, though i always get an XS in their oversized boyfriend shirts and heddy styles. I like a wrinkled shirt, I like the really soft cotton twill materials, the crisp ones actually bother my skin. I love shirts too, but it's so hard to the loose fitting type (like yours). I found a white one last year and I love it, so I'm constantly in the look out for similar styles. Will definitely try Steve Alan's when I have the funds! Great post-thanks for the heads up. thanks! :) slightly slouchy is the way to go IMO. These look great. I haven't found the perfectly tailored shirt yet - I also can't stand the too-tight look - so I'll definitely be checking these out. thanks! hope you find your perfect shirt soon. i love that every season SA comes out with a bunch of different colors and patterns. i love your paisley and Liberty print shirts! i don't think jcrew's buttondowns are very well made, alas. I love your button down shirts. The light blue is probably my favorite, i wear it with black slim pant, perfect for work. Lovely collection you’ve got! I didn't know SA shirts, but they look really nice. yeah steven alan has been making shirts since the mid 90s, in NYC his line is a perennial downtown favorite. miss sophie, i discovered your blog in january while doing a search for the dicker boots - it is a great resource! i enjoy your logical thought processes, your reviews on quality and sizing, and your approach to building your closet. i was wondering, how do the reverse seam shirts compare with the boyfriend shirts at steven alan? the reverse seam shirts tend to run a bit small as they are cut like a shrunken boy's shirt. the boyfriend shirts are basically the SA men's shirts sized down one size for women. there's more measurement info on the SA site. I was wondering what size in SL do you wear? I found their sizing tends to fit a smaller frame. i'm so confused about why they are called reverse seam! I read that they have a twisted placket and the french cuffs are turned in? lin (first comment) asked about this too. see my response :) it's meant to be a witty design detail! Thanks for this post- I found it searching for fit info for the SA reverse seam and just wanted to leave a note for potential future googlers. I am usually a 4/small in buttondowns, an XS if vanity sizing is really bad, and I went with a medium to get that slouchy fit. My first instinct was to get a small but I think it definitely would've gapped at the bust. I'm a 34B, for reference. Also, for the long-torsoed, the shirt is just the right length; any longer and it would be too cropped for my liking, so if you like extra length maybe best to err on the side of the boyfriend fit (and avoid the shrunken fit reverse seam altogether).